There has recently been some interest in getting Smoothie to run using the LPCXpresso 1769 breakout board for the LPC1769 chip, and components placed on a breadboard. If you don't mind the hackyness of breadboards, or if tinkering is in fact what you're after, this can be a quite nice solution. Warning : Breadboard setups are very sensitive to Electro-Magnetic Interference, you will most probably get false readings, resets and hangs if used on an actual machine, this page is for hackers looking into learning and testing new designs. It is not approriate for actual machines you want to use on a daily basis and expect to be reliable. If you like to tinker with reprap/CNC electronic stuffs you probably already have most of this. 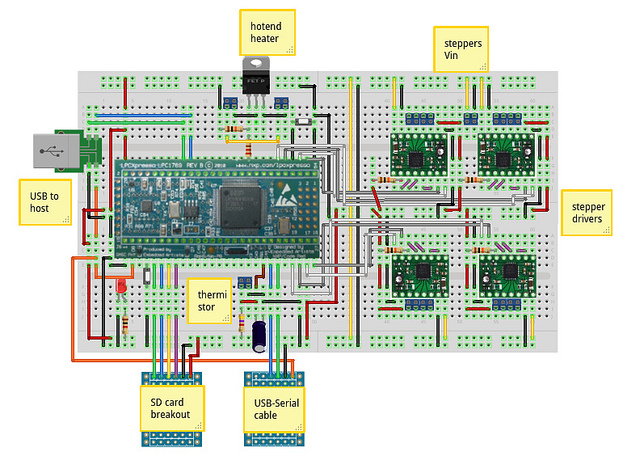 At the core you have the LPCXpresso board. 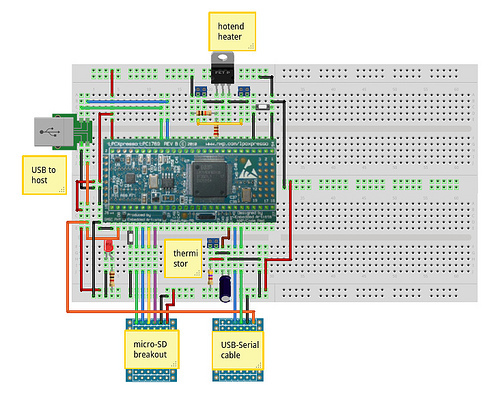 It can be powered from, and connected to the computer via either the USB port, or the USB to Serial adapter. The USB to Serial adapter can be used in place of the USB port, you'll be able to use Smoothie fine, but then you miss on all the fun where Smoothie connected to the computer via USB shows as both USB/Serial and Mass Storage, exposing the SD Card. The MicroSD breakout contains a SD card ( up to 2GB, that's the size of the cheapest you can find those days anyway ). On the SD Card is the config file to configure smoothie, and you can also put there GCode files and execute them from there. The 4 pololu drivers ( StepSticks would be fine, and are pin-compatible ) drive the steppers to move the machine and the extruder. If you're here to move a laser, you don't need 4, but only 2 ( or 3 if you have a Z axis ). The thermistor and hotend circuts are used to regulate the temperature in the 3D printer's hotend. TODO : Describe modifications for laser cutting, there are not a lot. Now instructions for a step-by-step assembly. The current design is quite compact, so there is not really much freedom on component placement, but this is mostly to say what connects to what. If you don't understand something, or don't see clearly what connects to where, you can look more in detail in the Fritzing file or contact by email. Warning: we will refer to the pin numbering found on the LPCXpresso PCB; this is different from the standard IC pin numbering, as both columns have increasing numbers from top to bottom instead of a counter clockwise numbering. You must solder the two long ranges of holes on that board with standard 2.54mm golden pins at the bottom. 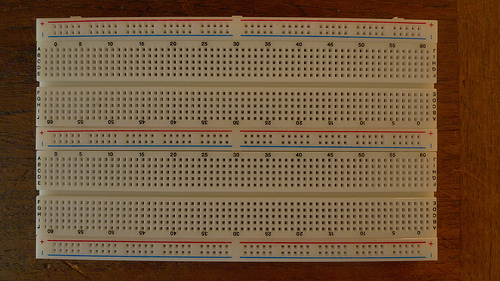 Then simply insert into the breadboard, with the first pins on the left at 6 pins from the border. 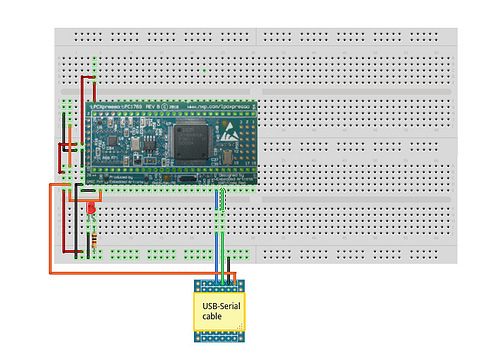 To flash the bootloader, and later eventally debug, you need to connect to the board via serial. That won't work via USB directly until smoothie in flashed in there. 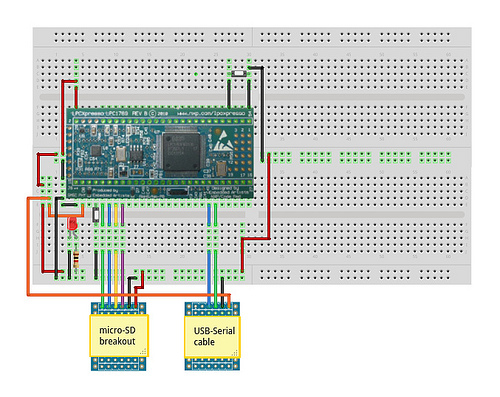 You can use a FTDIÂ cable, the Arduino USB2Serial board, or even directly an Arduino board, using pins 0 and 1 as TX and RX. GND ( black ) goes into the bottom rail of the two bottom power bars, and to the GND pin on the LPCXpresso. The 5V pin goes into the VIN ( 4.5V-14V ) pin on the LPCXpresso ( orange wires ). The LPCXpresso then outputs 3.3V, which is what we'll be using for our peripherals, from the top left pin ( red wires ). This goes into the top rail of the two bottom power bars. The 3.3V regulator on the LPCXpresso is located on the programmer side, so if you split the boards you will have to add an external 3.3V LDO. The LED and resistor are not necessary, but it's always nice to know you've connected the power correctly. The resistor value depends on your LED's luminosity and taste : I use 1Kohm on mine. Most leds will want less. You need a reset button to reset your board connected to pin 4, and a bootloader button connected to pin 51 (shown in diagram below) to get it to enter bootloader mode in order to flash the SD card bootloader ( this only needs to be done once ). Also a play/pause button is used to force the bootloader into DFU mode to flash the firmware, this is connected to pin p2.12, and is not shown in the following diagram. Both buttons are push buttons, and connect from their respective pins to GND. Lower left is RESET, and top right is BOOTLOADER. 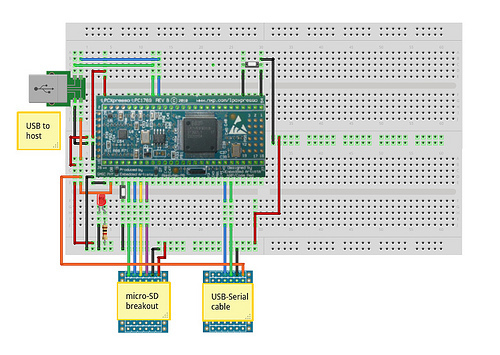 You'll then be able to flash the chip using lpc21isp following these instructions. To force the bootloader into DFU mode hold the play/pause button, press reset then release play/pause button. 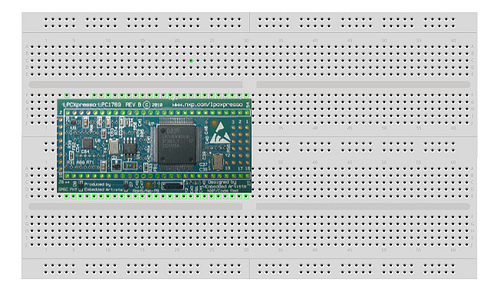 Exact connection will depend on the pin order for your microSD breakout board. You'll also have to connect red and black to the bottom 3.3V power bar. It is shown here separated from the breadboard, but most breakouts will plug right on the breadboard, there is room for that. If you have flashed the bootloader, copy smoothie as “firmware.bin” onto the sd card, it will be written to flash on reset, and you should get a nice welcome on the Serial cable. If flashing the bootloader works, but flashing firmwares from the SD card doesn't, you probably have a SD card problem. Try swapping DI and DO or using another SD card. SDHC may have compatibility issues, you may want to try an older card. USB connection is quite simple. It's pretty much the same as the serial cable : 5V to VIN ( orange ), GND to GND ( black ), connect D- ( green ) to pin 36 and D+ ( blue ) to pin 37 and you're done. If you have flashed the bootloader and then smoothie, it should show up as both Mass Storage, and USB/Serial to your computer. These two cricuits allow you to read the hotend's temperature, and change that temperature via a heater. You don't need that for CNC milling and lasercutting, so use a jumper and jump it if that's your case. The bottom circuit is the thermistor circuit. From pin 20, connect a 4.7Kohm resistor to 3.3V power ( orange ), and a 10uF capacitor to ground. The 2.54mm screw terminal connects the pin 20 and the ground to the two wires from your thermistor. The thermistor doesn't have a polarity so it can be connected either way. The top circuit is the Mosfet circuit, it controls the heating element in your hotend. Horizontal resistor is 10Kohm and connects from the Gate to GND ( pull-down resistor ) and the other one is 1Kohm and connects the Gate to pin 45 on the LPCXpresso. Left 2.54mm screw terminal is the power input for the heater element. If you want to use only one power supply for both the heater and the steppers ( will work fine with most ATX Power supplies ), you can connect this to the top right power bar instead where we will later have the stepper motors' power rail. The other 2.54mm screw terminal goes to the heater. 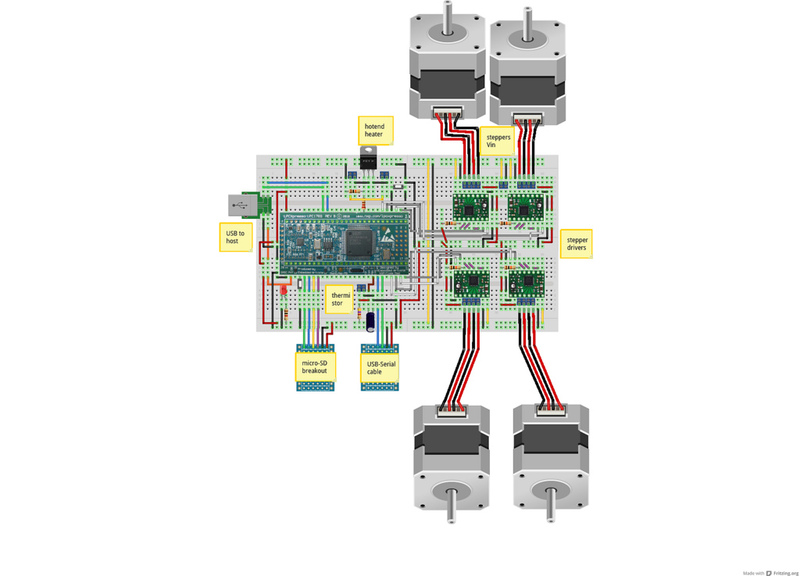 The single dual-2.54mm screw terminal is for power input for the stepper drivers. The top and bottom power bars are for that voltage input, the center one is for the 3.3V from the microcontroller. 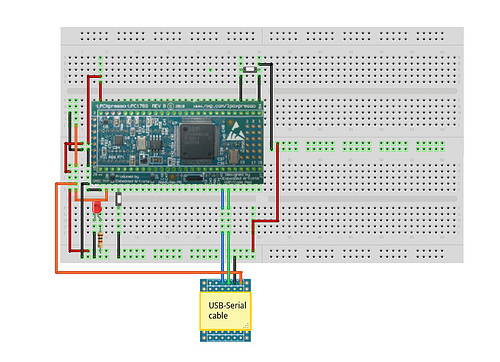 You are going to want to configure Smoothie to work with the pin assignment of your breadboard setup. The pinouts for the motors above are an example and actually conflict with other pins in current versions of smoothie so it is recommended you use the pinouts from this chart : http://smoothieware.org/lpc1769-pin-usage. If you have any question or if something is wrong/missing, please don't hesitate to email.